SUBIC, Philippines (Reuters) - U.S. President Donald Trump is no stranger to controversy and he has often come in for sharp criticism both at home and overseas, but in the town of Subic in the Philippines, he's a hero. Once home to one of the biggest U.S. naval facilities in the world, Subic is a haven for retired servicemen who seem thrilled that Trump is visiting the Philippines, and convinced the divisive tycoon can do no wrong. 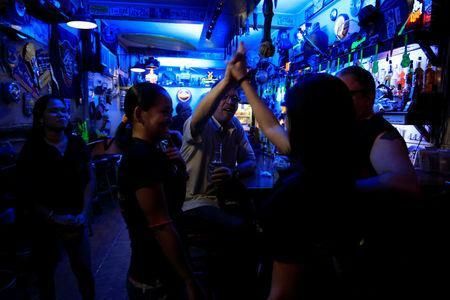 "Trump, I back him big time," said Mike McCarthy, a former master chief with the U.S. 7th Fleet, drinking in one of the American-themed bars that line Subic's main street, with names like "Alaska", "Crazy Horse" and "Rolling Stone". "They won't allow him to govern, but he's smarter than them, always a step ahead," he said of opponents of Trump. The U.S. president arrives in the capital Manila on Sunday for a summit of Asian leaders, on the last leg of a tour that has taken him to Japan, South Korea, China and Vietnam. "He's just doing things a different way, his Tweeting, his strong words. But where has he made a wrong call yet?" said McCarthy. A native of Florida who has lived in Subic for a decade, McCarthy said Trump's respect for veterans meant he's a big hit with them and among the military. "If he asked me to come and meet him in Manila, I'd be there in a shot," he added. Trump is set to meet Philippine President Rodrigo Duterte and will try to shore up relations strained by the mercurial Duterte's notorious anti-U.S. sentiment and his enthusiasm for better ties with Russia and China. Others who will be in Manila for the summit meetings include Chinese Premier Li Keqiang, Russian Premier Dmitry Medvedev and leaders from Japan, South Korea, India, Australia, New Zealand and member-states of the Association of Southeast Asian Nations. The Philippines will deploy nearly 60,000 police and army personnel to provide security. The Philippines has for decades been a key U.S. defense ally and although the base was closed in 1992, Subic has since received a regular flow of retirees and visits by U.S. warships for repairs, resupply and exercises. About 220,000 Americans, many of them military veterans, live in the Philippines. An additional 650,000 visit each year, according to U.S. State Department figures. Subic has maintained its American feel, with bars offering military discounts and restaurants serving anything from baby-back ribs, buffalo wings and steaks to burgers named "shotgun" and an omelette called "the sheriff". It has tattoo parlors, liquor stores with signs advertising bourbon whiskey and a Harley Davidson repair shop servicing the easy-rider motorcycles that have long been a fixture in the town of 100,000 people, about a three-hour drive north from Manila. 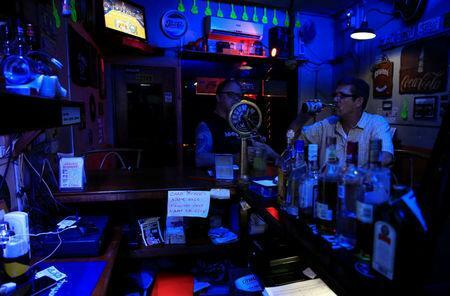 Veteran James Goodman, 51, has owned six bars during his 13 years in Subic. 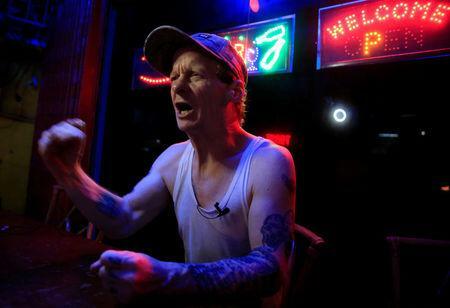 His latest venture, "Sit-n-Bull", has bar games, live sports and rock music that competes with the lively chatter of tattoo-clad patrons in tank tops. The walls are adorned with vehicle license plates from Florida, Ohio, California and Nevada, next to a neon-lit USA sign in red, white and blue. A guitar hangs next to a wood carving of a native Indian and an American Football playoff schedule offering hot dog promotions. "I'm very glad Donald Trump is coming here, I believe he and President Duterte will get along," said Goodman, from New Jersey. "He's for the American people ... I look forward to his leadership, I look forward to his re-election. "I'd love to meet Trump, I'd love to buy him a beer." His business partner Ronn Oliver, 54, who runs a nearby restaurant of the same name, says veterans appreciate Trump and recognize his shrewdness. "He knows what he's doing, he shocks, but he sets up his opponents, he plays them, he knows what reaction he's gonna get," said Oliver, a former serviceman and commercial fisherman from Seattle, Washington. "He needs to build more support, so people can catch up with what he's doing. They've gotta give him a couple of years to get into it." Christopher Lamb, 48, a fisherman who said he is from Florida, says he shook Trump's hand four decades ago. Wearing a baseball cap and white vest, he offers a few slurred words that show his pride in Trump's rise to the presidency. "I met this man, he was nothing then, and now he's the most powerful man in the world," said Lamb. Retiree Mike Allen, 66, from Ohio, has lived in Subic for a year and recognizes he might be the lone dissenter when it comes to Trump. "The military guys here, they love him," he said, with a shake of the head. "He says one thing one day and another thing the next. He's isolating us and he loves white supremacists. An American president can't be like that."